Volunteer firefighter's Sheri Torbett, with the Sequoyah Volunteer Fire Department, uses a leaf blower Thursday to turn back approaching flames near the Mowbray Volunteer Fire Hall in Soddy-Daisy. POLL: Are the area's wildfires causing you health problems? ATLANTA (AP) — Due to the ongoing drought and the risk of wildfires, Gov. Nathan Deal has banned the ignition of all fireworks in much of the state. News outlets report that Deal issued an executive order on Monday to expand a Level 1 drought declaration across 110 of Georgia's 159 counties. The affected counties are across northern Georgia as well as all of the counties that make up metro Atlanta. The Level 1 declaration requires public water systems to inform customers about the dry conditions and encourage conservation, though it doesn't restrict water use. WABE-FM reports the National Weather Service forecasts that the drought will continue at least through early-2017. Sohn: Might wildfire smoke be harbinger of days to come? Fire crews from around the nation are making progress to contain three wildfires in northwest Hamilton County that have contributed to the smoky haze that has engulfed the city for days. Meanwhile, in Georgia, one large fire was still burning out of control on Lookout Mountain below Cloudland Canyon near the Alabama state line, but houses in the area were not damaged, fire officials said. Authorities arrested two people Monday in separate incidents and charged them with arson. An Alabama man, Matthew Ryan Wallace, 27, of Tuscaloosa, was charged with setting a fire along Standifer Grant Road in Sequatchie County on Monday. Authorities said he was identified after a vehicle they say he was driving was photographed by a deer camera set up by a homeowner. Authorities said he admitted to dropping a cigarette into a pile of leaves, watching a fire start, and driving away without extinguishing the flames. Wallace faces a maximum penalty of up to six years behind bars and a fine of up to $3,000. In Monroe County, Tenn., Charles Edward Martin, 50, of Madisonville, was arrested and charged with setting a fire along Gamble Road. He is charged with setting fire to personal property or land, reckless burning and resisting arrest. The state is offering a reward of up to $2,500 for tips leading to an arson arrest. On Signal Mountain, a 1,000-plus acre fire on an area of Walden's Ridge called Flipper Bend is 95 percent contained, according to Julie Allen, a spokeswoman for the Florida Forestry Commission, which is coordinating some of the local firefighting efforts. "We were really shooting for 100 percent containment [Monday] and the guys on the line did an incredible job," Allen said. "So hopefully we can boost that up to 100 percent today." The Mowbray Mountain fire that threatened homes on Arnat Drive last week is at 800 acres and is 70 percent contained, she said. A separate, 550-acre fire on Poe Road that gave fire crews their biggest challenge Monday is 60 percent contained. No homes were threatened by the three fires Tuesday morning, Allen said. "They're really making a lot of progress," he said. "There are flames and fire out there, it's just not as active as it had been the week before." Crews from Oregon, California, Texas, Nevada and Florida continued working to contain and extinguish the fires. Rob Pentzer, Oregon division of forestry supervisor, said crews are "over the hump" fighting the fires in the northwest portion of the county. "But you're never out of the woods until it's over," he said Tuesday morning as crews headed back into the woods. "You're going to need at least an inch of rain to make you feel better about what's going on around here." Many of the Tennessee state forestry crews that had been fighting the three fires have been moved to other areas of drought-ridden East Tennessee where aid is needed. Gov. 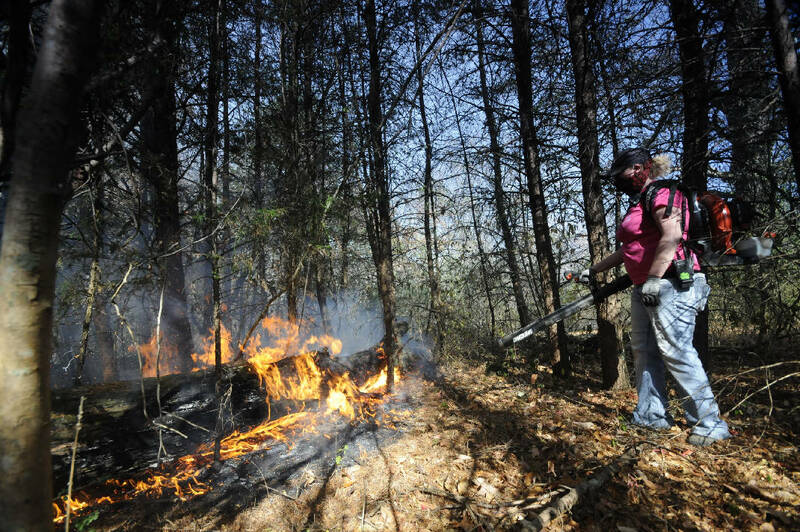 Bill Haslam issued a regional burn ban Monday night covering 51 counties, including all of southeast Tennessee. There were 67 active wildfires in the state, as of Tuesday morning. The ban includes campfires and burning of brush, vegetation, household waste and construction debris. It is scheduled to remain in effect until Dec. 15. Violating a burn ban is considered a Class A misdemeanor. Hamilton County Schools Interim Superintendent Kirk Kelly attended a briefing Tuesday morning with forestry officials and thanked them for their efforts. He told reporters that, with 78 schools in the district, the department of education is handling smoke concerns on a case-by-case basis. "Our maintenance department has been out in the schools most affected working to do what they can in terms of the heating and air that we have in those schools," Kelly said. "Issues that we have with students, we're working with them on an individual basis if there are health reasons why being in the school may be a bad condition for them." Chattanooga hospitals have treated dozens of patients due to the wildfire smoke, and local doctors say it is particularly threatening to those already suffering from lung or heart diseases. East Tennessee is under a "Code Orange" air alert, meaning the air may be unhealthy for sensitive groups. But the Chattanooga-Hamilton County Air Pollution Control Board on Tuesday afternoon issued a "Code Red" alert, meaning conditions are unhealthy for everyone. Under a Code Red alert, those with heart or lung disease, seniors, children, and active adults should avoid any strenuous outdoor activity. Parents with students who might be affected by smoke-related issues are encouraged to communicate with the school to work out a solution. Smoke-related absent days won't be counted against students, Kelly said. Several other wildfires continue to burn around the tri-state area and the Southeast. The Georgia Forestry Commission extinguished 18 fires in North Georgia on Monday and into Tuesday morning, according to a news release. A fire in Dade County, Ga., on Lookout Mountain joined with another fire and is covering 2,000 acres. It was 10 percent contained and expected to reach 3,200 acres, according to Georgia forestry. Firefighters were working to clear leaves and underbrush from around houses and cut back wooded areas between homes, fire officials said. Most of the homes are right on the west brow of the mountain, with the fire burning below them, so firefighters have a difficult time reaching the flames. For several miles on the west side of Old State Highway 157, Tatum Gulf Road, and Bible Gulf Road, which run along the bluff, fire crews have burned off the leaves and underbrush from the roadway to the cliff to deny the wildfire a source of fuel. According to Forestry Commission spokesman Seth Hawkins, 160 homes could potentially be threatened, "although no structure damage is expected." Fire crews are working closely with affected residents. Residents of the Lookout Highlands subdivision were evacuated Monday and are expected to be allowed back in their homes by 8 a.m. today, according to Georgia Forestry. Another Lookout Mountain fire along Creek Road is almost entirely contained and is expected to reach 150 acres. The 590-acre fire on Rocky Face Mountain is 98 percent contained. Fires also are burning in the Cherokee National Forest, which skirts the Tennessee-North Carolina border, and in the Rough Ridge area of the Cohutta Wilderness in rural North Georgia. "The Rough Ridge Fire being managed by the U.S. Forest Service continues to grow in size and complexity," the Georgia forestry news release said. "This fire can now be seen from many areas of North Georgia including the Conasauga River, and it is being closely worked and monitored by state, federal and local agencies." The Tennessee Valley Authority also has issued a burn ban on all its public lands in the Tennessee Valley. In Alabama, the fire marshal said state officers are investigating two of nearly 1,100 statewide wildfires as possible arson, according to The Associated Press. Fire Marshal Scott Pilgreen said a fire that burned 800 acres in DeKalb County is under investigation. So is a series of three blazes that burned 65 acres along Interstate 65 north of Birmingham last week. No arrests have been made. But Pilgreen said officers also issued a few misdemeanor citations to people who allegedly violated a statewide no-burn order during the drought. The Alabama Forestry Commission said about 1,100 wildfires have burned more than 12,500 acres in the last month. The agency attributes most of those blazes to carelessness, such as people tossing cigarette butts on the ground. But a spokeswoman says the cause of most of those wildfires is unknown. Contact staff writer Steve Johnson at sjohnson@timesfreepress.com or 423-757-6673. Contact staff writer David Cobb at dcobb@timesfreepress.com or 423-757-6249.